105 records – page 1 of 3. 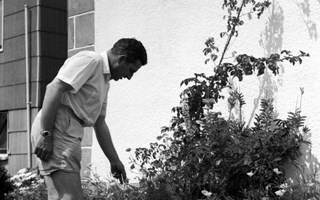 Photograph of Harold Johnston standing alongside a row of plants, pruning in the garden of the Johnston family's Venables Street home. 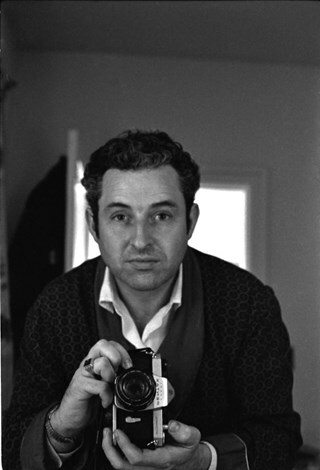 Photograph is a self-portrait of photographer, Harold H. Johnston, taken while looking into a mirror. 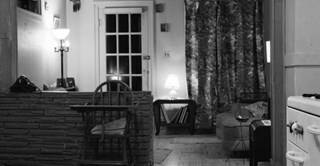 Harold is seen holding a 35mm Pentax camera and standing in front of an open door. This photograph was most likely taken inside the Johnston family home at 4447 Venables Street. 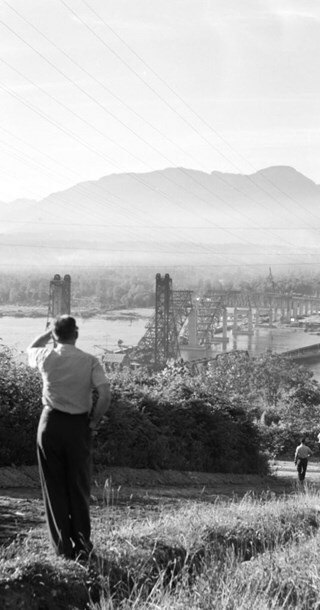 Photograph of the Second Narrows Bridge after its collapse in June, 1958. A child and dog are visible walking along a path in the foreground. 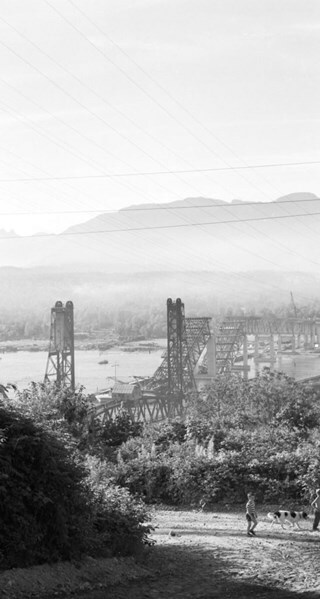 Photograph of the Second Narrows Bridge after its collapse in June, 1958. 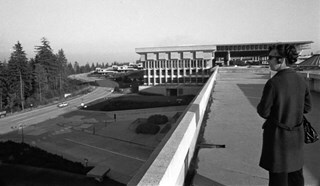 An unidentified man can be seen in the foreground of the photograph while another is visible at the bottom right. 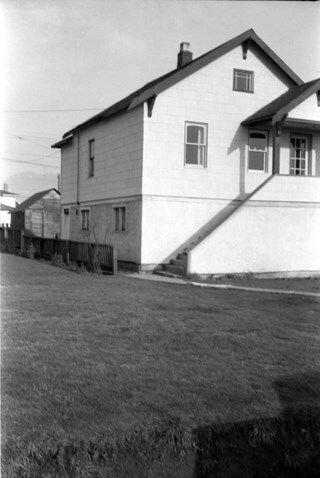 Photograph of the original front entrance of the home belonging to Harold Johnston and his family at 4447 Venables Street, Burnaby. 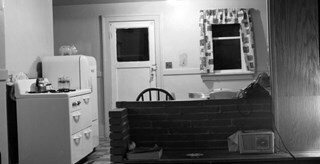 Photograph of the original kitchen of the home belonging to Harold Johnston and his family at 4447 Venables Street, Burnaby. 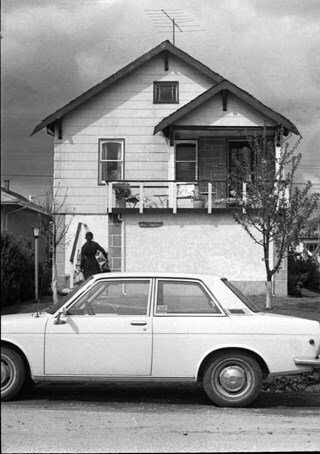 Photograph of the home belonging to Harold Johnston and his family, located at 4447 Venables Street. 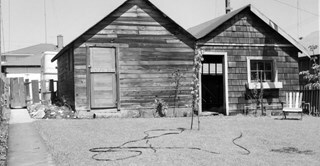 Photograph of the original garage at the Johnston family home at 4447 Venables Street. 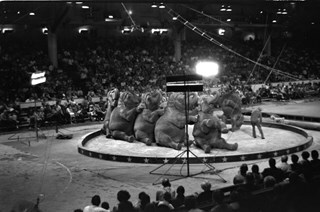 Photograph of six elephants performing in a circus ring at Exhibition Park, Vancouver. A large crowd is watching the animals and a trainer can be seen standing at the right of the ring. 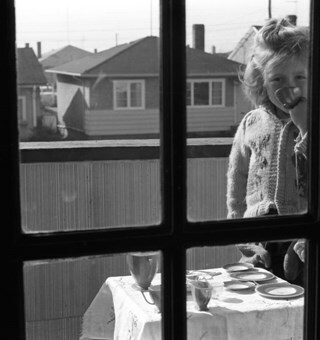 Photograph of a girl identified as Charlene, standing next to a table outdoors that has been set for tea. The photograph was taken looking through a window to the outdoors. Although the location of the home is not identitifed, it is likely the Johnston family house at 4447 Venables Street. Photograph taken looking over the 4400 block of Venables Street after a snowfall. The photograph was likely taken from the home of Harold Johnston at 4447 Venables Street. Photograph taken looking out a window onto Venables Street. The street and automobiles parked along it are covered with snow. The photograph was likely taken from the Johnston family home at 4447 Venables Street. 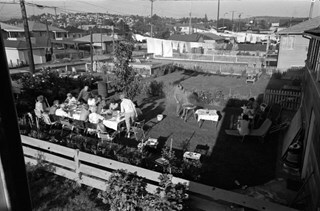 Photograph of approximately fifteen people in the backyard of a Venables Street home, having a barbeque. Eleven people are seated or standing at a picnic table to the left, three are seated or standing near lawn furniture to the right, and one is at the barbeque grill. The photograph was probably taken near the Johnston family at 4447 Venables Street. Photograph taken looking along Venables Street. A number of cars and trucks are parked along the street. 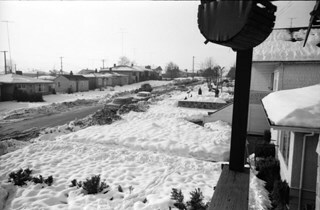 Photograph taken looking west along Venables Street, taken from the home of Harold Johnston at 4447 Venables. Cars can be seen parked along the side of the street. 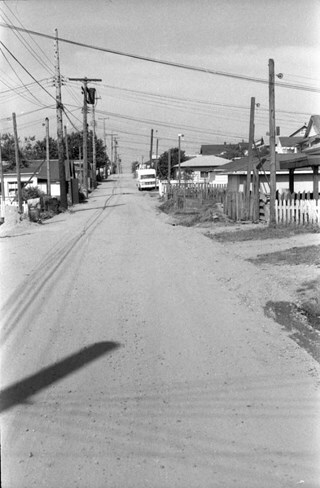 Photograph taken looking east along Venables Street, taken from the home of Harold Johnston at 4447 Venables. Cars can be seen parked along the side of the street. Photograph looking west along the lane behind Venables Street. This photograph was most likely taken outside the home of Harold Johnston at 4447 Venables. Photograph taken looking west along Venables Street. This photograph was most likely taken outside the home of Harold Johnston at 4447 Venables. Photograph taken looking north along Willingdon Avenue. Photograph taken looking south along Willingdon Avenue. 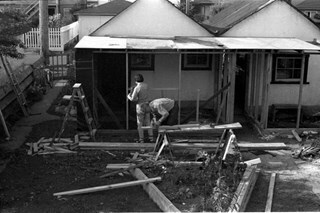 Photograph of two men working on a garage identified as belonging to Sean Pepere. Construction material and debris are visible around the worksite The photograph was most likely taken in the Venables Street area of Burnaby. 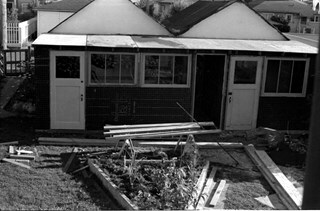 Photograph of a partially completed garage identified as belonging to Sean Pepere. Construction material and debris are visible around the worksite. 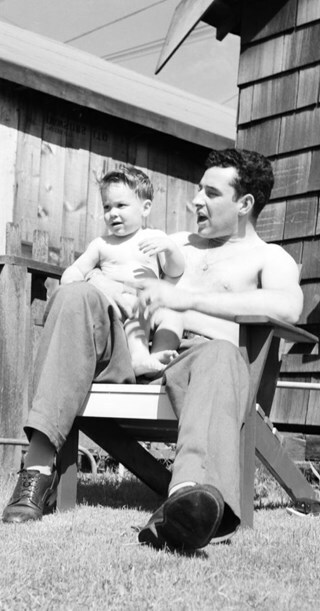 The photograph was most likely taken in the Venables Street area of Burnaby. 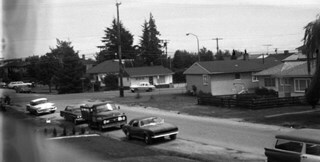 Photograph is a panorama of Venables Street taken from 4447 Venables - the home of photographer, Harold Johnston. 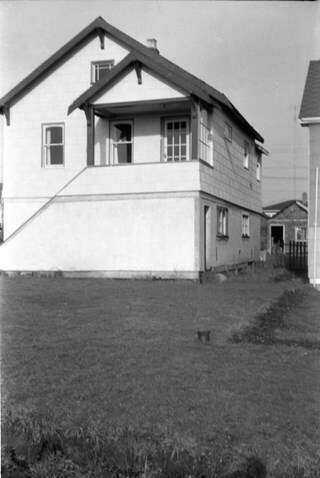 Photograph looking east from the backyard of the Johnston family home at 4447 Venables Street. 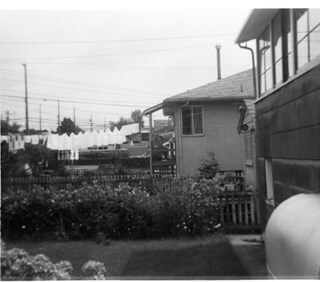 A clothesline draped with clothes can be seen in the background. 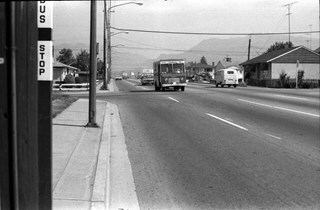 Photograph taken slightly west of the intersection, at Willingdon, looking east along Hastings Street. The Esso gas station is at the right and the Gulf station is at the left. Numerous stores and businesses are visible. 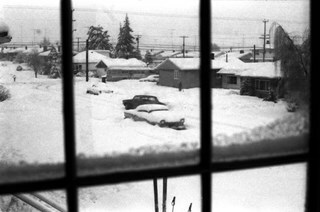 Photograph is a panorama of Venables Street after a snowfall. 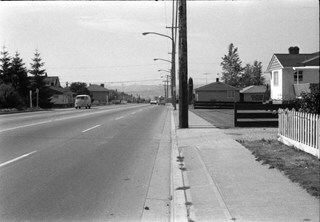 The photograph was taken outside of the Johnston family home at 4447 Venables Street (which can be seen at centre). 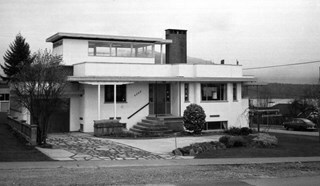 Photograph of the exterior of an art deco style house in Burnaby. The home was located at 4289 Oxford Street at the northwest corner of Madison Avenue. 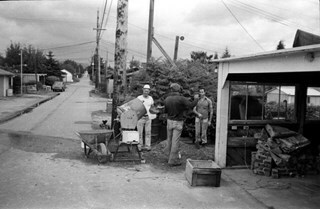 Photograph of three men standing around a cement mixer, preparing cement. The photograph was taken in the lane behind the Johnston family home in the 4400 block of Venables Street. Photograph of a woman standing next to two children on a tricycle on Venables Street. A man is on the far right standing next to a parked car. 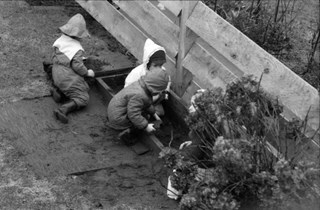 Three of the people in the photograph are identified by first name only as Sharron, Andrea and Frank. 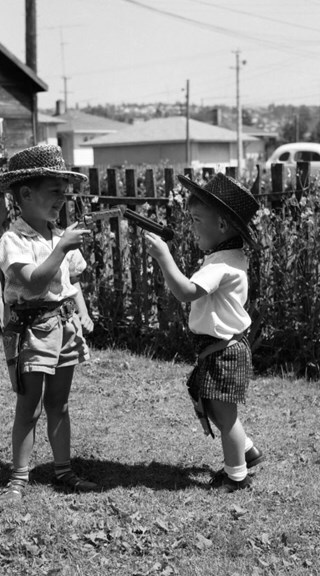 The photograph was most likely taken near the Johnston family home at 4447 Venables Street. 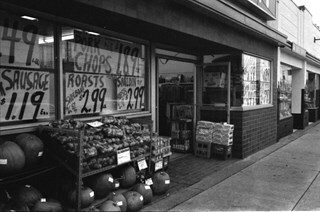 Photograph of an unidentified grocery store. 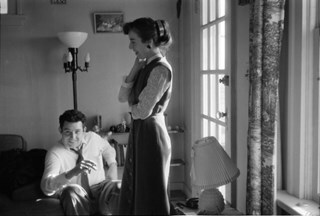 Photograph of Harold Johnston (seated) and his wife, Frances in the living room of their Venables Street home in Burnaby. 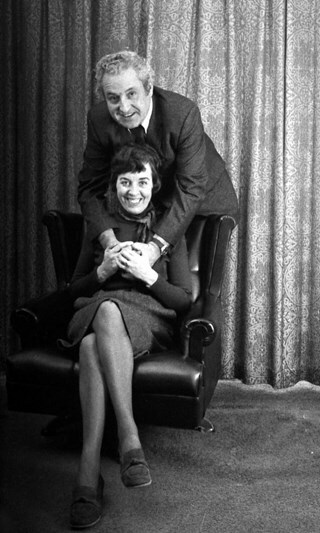 Photograph of Frances Johnston (seated) with her husband Harold standing behind her. The photograph was likely taken inside the Johnston family home at 4447 Venables Street. 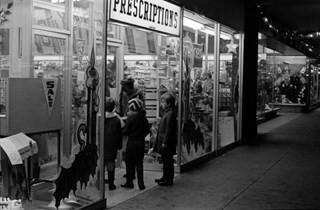 Photograph of a woman (possibly Frances Johnston) and three children standing in the doorway of a store, with a sign above them reading "prescriptions." A line of storefronts is visible along the sidewalk, taken in front of Brentwood Shopping Centre. 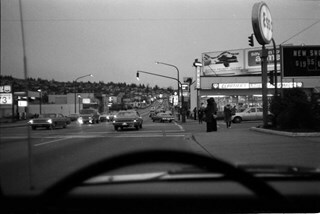 Photograph taken looking east along Hastings Street, near Gilmore Avenue. 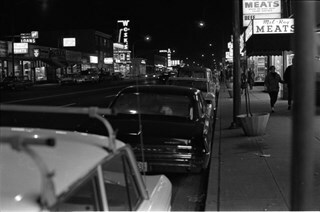 The photograph was taken at night and a number of businesses and business signs are visible, including those for Wosk's and the Admiral Hotel (at 4125 Hastings). 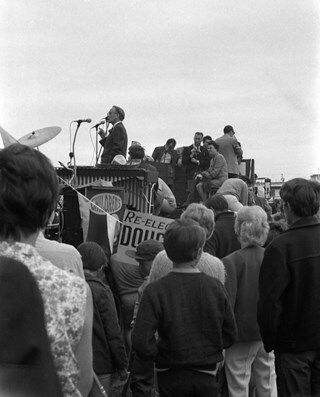 Photograph of a crowd of people gathered to listen to Tommy Douglas deliver a speech at Confederation Park. 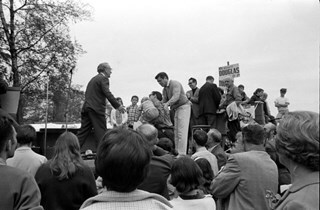 Tommy Douglas served as the Member of Parliment for Burnaby-Coquitlam from 1962 to 1968. He went on to become the seventh Premier of Saskatchewan. Photograph of a crowd of people gathered to listen to Tommy Douglas deliver a speech at Confederation Park. A few people in the audience are holding signs that read "Re-elect Douglas." Tommy Douglas served as the MP for Burnaby-Coquitlam from 1962 to 1968. He went on to become the 7th Premier of Saskatchewan. Photograph of the Johnston family home at 4447 Venables Street. A woman (Frances Johnston) can be seen carrying parcels and walking towards the front steps of the home. A car is parked in front of the house. 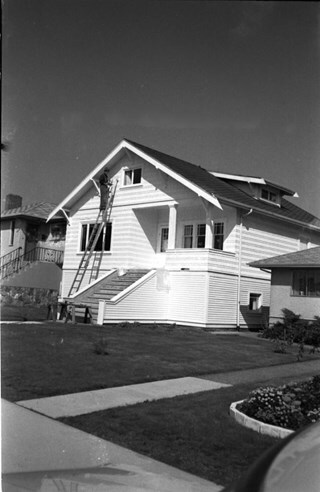 Photograph of Ernie Fraser standing at the top of a ladder painting a house in the 4400 block of Venables Street. 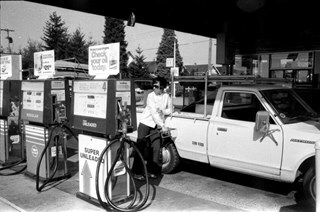 Photograph shows Frances Johnston filling up a truck with fuel at a Gulf petrol station. 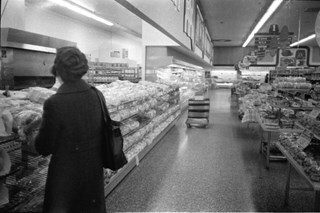 Photograph of Frances Johnston with her back to the camera, standing in the bakery aisle of an unidentified grocery store. 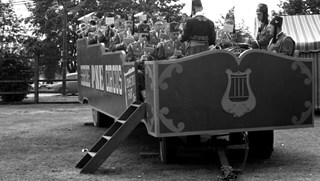 Photograph of approximately twenty band members of the Shrine Circus sitting in a Pacific National Exhibition float, playing musical instruments. Painted on the side of the float are the words "Shrine PNE Circus." 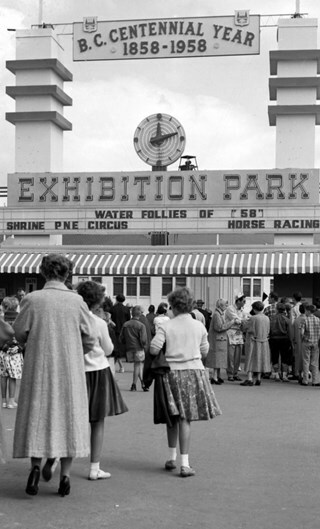 Photograph of a crowd of people gathered near the entrance to the exhibition park at the Pacific National Exhibition (PNE). A banner at the top of the entrance reads "B.C. Centennial Year 1858-1958" and the marquis below the "Exhibition Park" sign reads "Water Follies of 58 / Shrine PNE Circus / Horse Racing." None of the people in the photograph are identified. 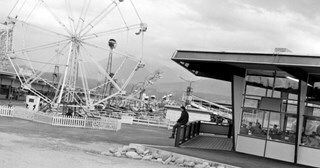 Photograph of the ferris wheel at the Pacific National Exhibition.